Collectors of Carr China ashtrays have a wide assortment of style and patterns to choose from. Some are more easily found than others and most command a rather high price versus other similar-sized Carr items. If you have other Carr ashtrays you'd like to share a picture of, please contact us at carrmaster@carrchina.com. 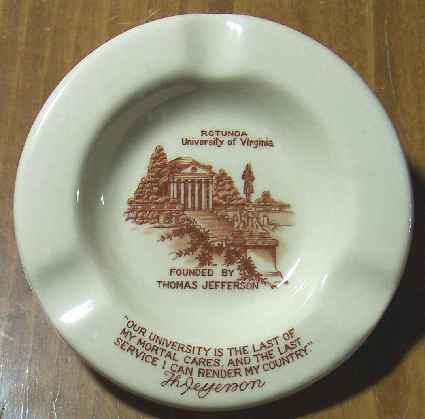 This Glo-tan ashtray was made for the University of Virginia at Charlottesville. 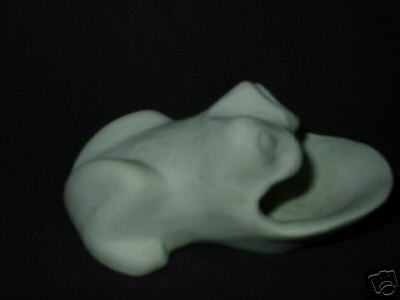 Little is known about the history of these rare Carr China frog ashtrays. This one was found in the estate of Wheeler Carr Bachman and is both unmarked and unglazed. It recently sold on eBay for $113.27. Marked ones have been known to sell for upwards of $1,000.00. These frogs are rumored to be the work of Calie and Andy Moats, employees of the factory who molded, casted and fired the frogs with Carr clay and glazes in the early 1950s. 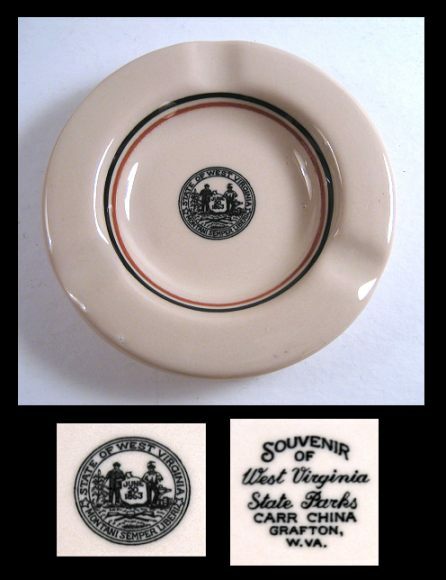 Carr China made numerous items for the State of West Virginia, including china used in the State Park recreation system. This ashtray was a souvenir sold in the park gift shops. 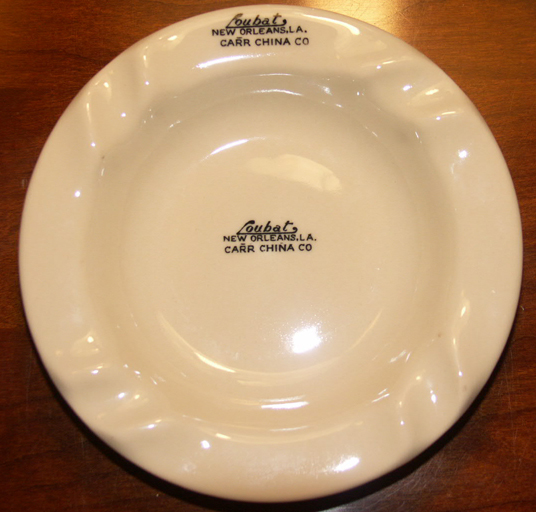 Carr's business included commercial wares for hotels, restaurants and other entities that were personalized with the name of client and often marked with the names of both the Carr China Company and the retaurant supplier representing the wares. 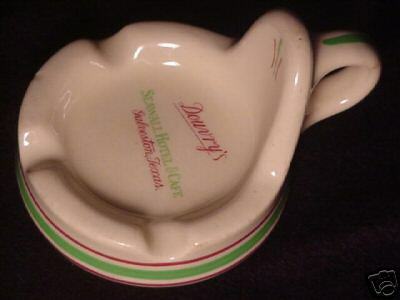 This nappy ashtray was made for the Galveston, TX Douvry's hotel and was supplied by Southern Hotel Supply Company of Houston, TX. It sold in 2006 for $102.50 on eBay. 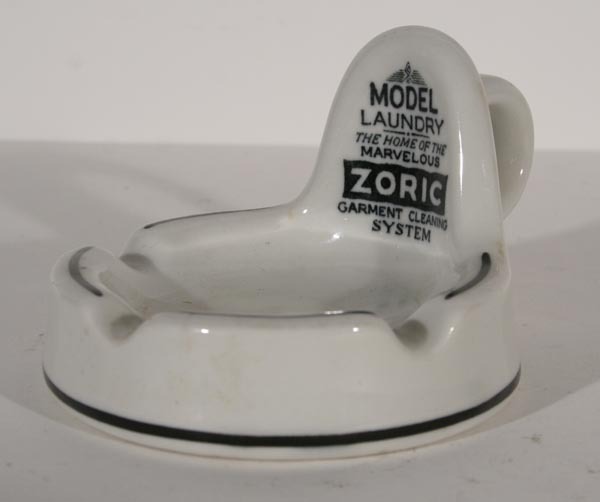 This petite ashtray was made for Model's Laundry and is marked "Carr China 1936." This "Jefferson" style ashtray was is a 4 1/2" promotional piece made by Carr China for their New Orleans, L.A., distributor Loubat. Loubat is most known for their distribution of the Cafe Brulot cups for Brennan's. It is on Glo-Tan with black ink. This Glo-Tan ashtray was made as a World War II Army Air Corp piece. The specific client is not known. This ashtray is a promotional piece made by Carr China for their distributor in Wichita, Kansas. While it is not backstamped, a newspaper advertisment in a December 15, 1947 Amarillo (TX) Globe identifies the Wichita China Company as a Carr China distributor. The body and type match other Carr works exactly, deeming this unmarked piece to be a Carr China ware. This beautifull and unusual Glo-Tan backstamped ashtray depicts two ladies and a young girl enjoying the outdoors. The front rim of the ashtray has a slightly pink hue and is rimmed in gold. A pattern name or client is not known.